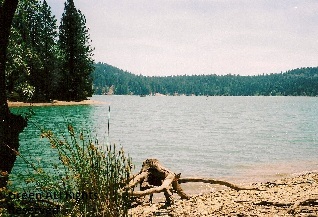 Scotts Flat Reservoir lies nestled in conifer forest, and is beautiful beyond the imagination. This popular destination is open year-round twenty-four hours a day to all types of boating, except for jet and waterskiing. If you have never paddled at night, this is the perfect place to give it a try. With a companion, it’s safer and more romantic. Paddling under the stars is an experience you will never forget. The excellent paddling opportunities and outstanding camping facilities put Scotts Flat Reservoir at the top of my list of lakes to paddle in Northern California. Sailing, and windsurfing are just a couple of the many aquatic activities that can be enjoyed here. There are also numerous marked and well maintained trails in the area that provide a pleasant scenic hike. The only drawback at the reservoir is the fast-moving powerboats that disrupt the peaceful atmosphere and the water’s perfect reflections.Scotts Flat Reservoir has a variety of fish species which consists of rainbow and brown trout, kokanee salmon, small and largemouth bass, catfish, and bluegill. It is stocked with 18,000 rainbow, and 2,000 browns in the 10 to 12 in range beginning from April thr ough mid summer, which makes it the best time of year to catch trout at this gorgeous destination. This reservoir also provides pretty good smallmouth bass fishing during the summer, in the early morning and in the evening.